Amazon Coins is a virtual currency from Amazon.com which can be used to purchase apps and games for the Kindle and Android from the Amazon Appstore, or for in-app purchase. Amazon normally sells Amazon Coins at up to 10% discount to its face value to promote the use of the virtual currency. In other words, Amazon Coins is just like a cold, hard cash, though it can only be used within Android phone or tablet and Kindle Fire devices with Amazon Appstore, and on Amazon.com. 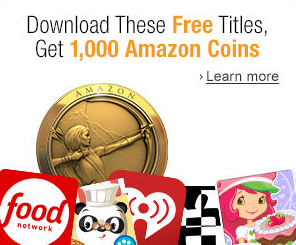 If you want to get some Amazon Coins for free, Amazon is now offering 200 Amazon Coins each for 5 selected free Android apps, for a total value of $10 (1000 Amazon Coins) as each coin worth 1 cent. As these apps are free, you do not need to pay to get them. If you’re previously purchased any of these apps, you may repurchase them to enjoy the free Amazon Coins. The promotional Coins granted to your account expire on the last day of the calendar month one year after been rewarded. So remember to use the free Coins to purchase apps and games on Amazon Appstore, such as the popular Plex app which goes for just $0.99 versus original listed price of $4.99 or GTA San Andreas for free 2000 Coins at the cost of $6.99 (or 699 Coins).